Female Iranian soccer fans are becoming more emboldened in their defiance of Iranian regulations that bar them from attending football matches. 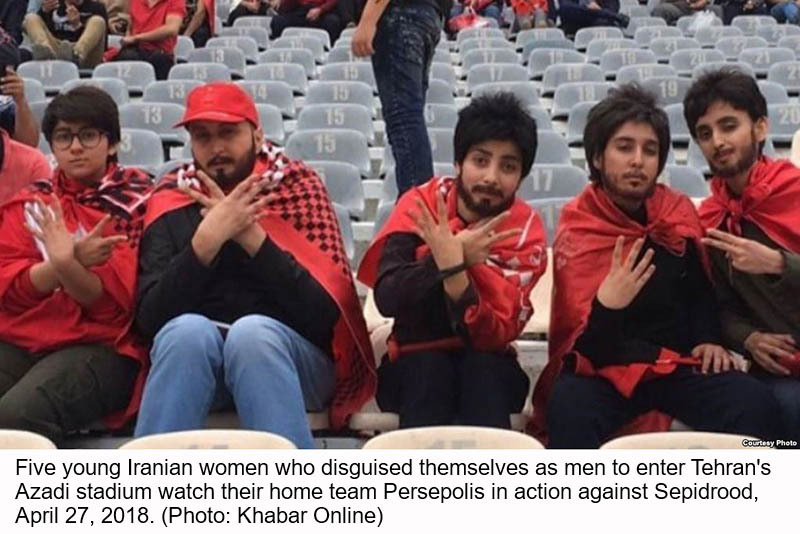 In recent days, Iranian social media users have been sharing a photo of five young women who disguised themselves as men to attend last Friday's domestic football league match at Tehran's Azadi stadium. The five fans used makeup to give themselves beards and male haircuts as they watched their home team, Persepolis, defeat visiting rivals Sepidrood of the northern city of Rasht. An Iranian state news site loyal to Parliament speaker Ali Larijani, Khabar Online, later published what it said was an interview with one of the five women who appeared in the photo. In the interview, the woman who gave her name as Zahra said it was the third time she had sneaked into Azadi stadium for a male-fan-only football match. She also said she had done her own makeup at home. Another female Persepolis fan who goes by the name of Zeinab on Instagram and has 124,000 followers has been posting a series of photos and video clips in recent weeks, showing herself in similar male disguises, both inside a stadium and outside. ​Iran has been barring women from attending some men's sporting events, especially football, since the first few years after its 1979 Islamic Revolution. In an interview with VOA Persian on Monday, Brussels-based Iranian activist Darya Safai, founder of the social media movement "Let Iranian women enter their stadiums," said the women who recently revealed their disguises publicly have been encouraged by seeing other women join their campaign of civil disobedience. "You feel strong, you feel that you are able to change things," she said. But Safai said the female football fans' campaign also has put them at risk of government prosecution. "They are afraid. It cost them a lot of stress," Safai said. The head of world football governing body FIFA, Gianni Infantino, said on a visit to Iran in March that he secured a pledge from Iranian leaders that they will "soon" allow women to attend men's football matches - something advocated by FIFA. Iran has not announced any such moves since then, while Safai said she has not seen any FIFA action to press Tehran to follow up on that commitment.